Buffalo Plaid. It’s a beautiful thing. And on this cold winter day, this crochet buffalo plaid cup cozy is just the thing. So put on your comfy clothes and your warmest sweatshirt and get ready to wrap your hands around this cup of goodness. 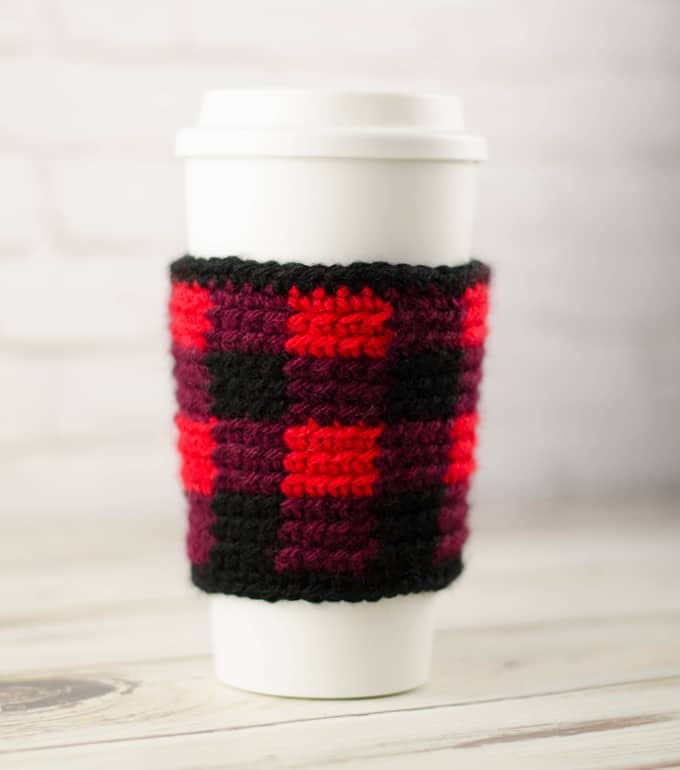 The Buffalo Plaid Cup Cozy is the perfect project for practicing your tapestry crochet skills. The stitches are simple–just single crochets. It’s the color changes that make this spectacular. This particular project is worked in the back loops. I just love the nice clean lines when tapestry crochet is worked in the back loops, don’t you? Buffalo plaid is worked with 3 colors: red, burgundy and black. Black is easy. Finding a red and a burgundy that are just right can be a challenge. I love Vanna’s Choice yarn and think that the Scarlett, Black and Burgundy are the perfect mix of colors for buffalo plaid projects. If you are trying to find colors on your own, its best to “audition” them at the same time so you can be sure they will work well together. For this project, two colors are used in each row. The non working yarn is carried along and crocheted right over. Check out this post on how to tapestry crochet for everything you need to know. This project is worked in joined rounds (joined with a sl st every round). That way you are always working on the right side of the work, a key component of this back loop technique. Thank you to Lion Brand for providing the yarn for this project! Lion Brand Vanna’s Choice: Scarlett, Black and Burgundy, 1/2 oz each. With black yarn, chain 40 and join. Try this ring on your cup to make sure it will fit. If you need to make it bigger, try again with a larger hook. If it needs to be smaller, try a smaller hook. R2-4: With black, Ch 1 (note turning chain DOES NOT count as stitch here and throughout), *sc in next 4 st, changing to burgundy in last st, sc in next 4 st, changing to black in last st*, repeat * to * around. sl st to join. At end of last round, do not change color in the last stitch. Note: At the end of each group of 3 rows, there will be a color that will not be used for the next 3 rows. You have 2 choices. You can cut the yarn and weave that piece in. Or you can keep that yarn out of play and just weave it up on the wrong side as you join the rows. Your choice. R5-7: With burgundy, Ch 1 (note turning chain DOES NOT count as stitch here and throughout), *sc in next 4 st, changing to red in last st, sc in next 4 st, changing to burgundy in last st*, repeat * to * around. sl st to join. At end of last round, change to black in last stitch. Row 14: With black, ch1 and sc around. Fasten off and weave in ends. 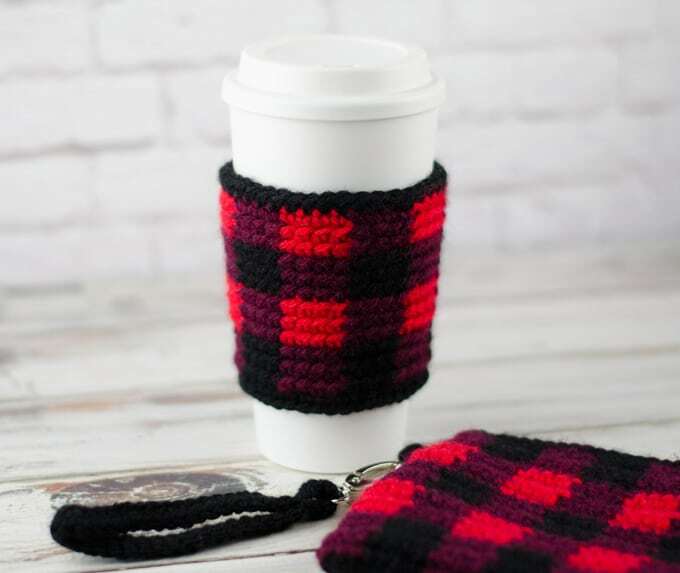 If you loved the buffalo plaid wristlet be sure to check out the Buffalo Plaid Wristlet and the Buffalo Plaid Cowl. I love seeing your finished projects! If you enjoyed working the Buffalo Plaid Cup Cozy, I’d love to see yours on Instagram, be sure to tag me @crochet365knittoo. If you are on Facebook, stop over to the Crochet 365 Knit Too Facebook page or pop over to the Crochet365KnitToo Club and share a photo! I’d love to see your work! Written pattern copyright Cheryl Bennett 2018, all rights reserved. Please do not reprint or repost this pattern. 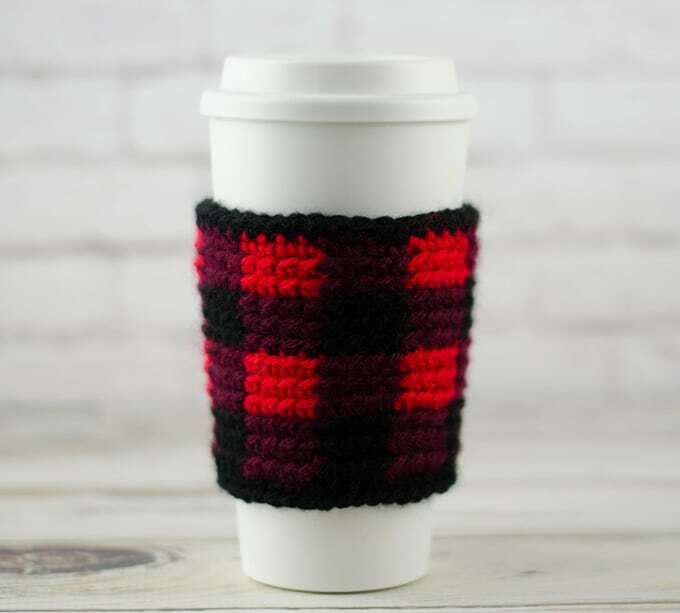 If you would like to share this Buffalo Plaid Cup Cozy pattern with others, just link to this page. If you’d like to make items for sale from this pattern, please visit my About page for more information. Thank you to Lion Brand for providing the yarn for this pattern. « What is Tapestry Crochet?